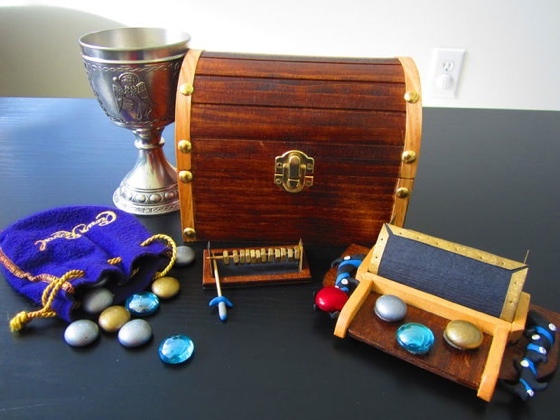 I’ve never heard of Moraff’s stones before I ran across this instructable, so I’m not sure how true to the original CrazyClever has managed to get their conversion. Regardless, it’s a very cool looking board game. In their instructable they walk us through the process they did while creating the game. So if you’re looking to make your own version, you’ll either have to message them there, or replicate what’s been done in the same way that they did; by trial and error. What I like about this most is getting to see some of the though process that went into creating a custom board game. I wish there was about 100 more pictures though, since it would be an interesting thing to see how this whole thing progressed from idea to completion. Still a cool instructable though. And of course the game itself looks fantastic. Stones is an old DOS game created by Steve Moraff in 1990 as a part of his Moraff’s World series of adventure games. It is a gambling/ trading game where you are pitted against monsters in a tavern, trying to earn the strongest hand. It is a four person game and it is fun for most age levels, so it should make for a great family game.